(P1) Students in Goteborg, Sweden, need to travel in the busy city center. But now they do not need to take a bus or a taxi. 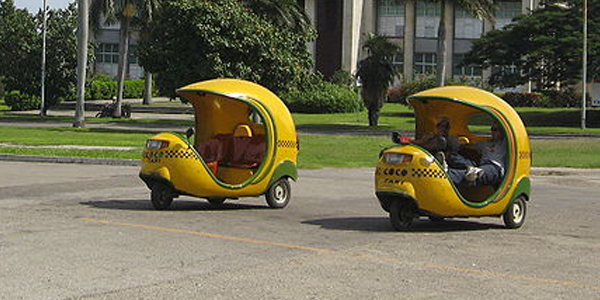 They can use a Taxi-pod, a little yellow battery-powered car with three wheels. (P2) The company, Burst, wants to solve the problem with traffic in big cities. It would like to offer a perfect service for short trips in the city. (P3) People on buses usually travel a long way. They are not in a hurry and they do not need to get to their final point. For lots of people, it is very important to travel quicker. (P4) This service is not only about speed. The makers of these cars also want to improve air quality. They also want to solve traffic jam problems. (P5) One of the passengers thinks that the Taxi-pods are good for cleaner air, cheap, easy to use in the city, and fun. Do you think taxi-pods are a good idea? Why or why not? How do you move around in a busy city? Would you buy a taxi-pod if they were available in your city? Why or why not? The Taxi-pod moves on __________ wheels. Burst is the name of a ____________. What 4 things did a user of the Taxi-pod say about the transportation?